Ideally, justice is a universal good: the law protects equally the rights of the rich and powerful, the poor and marginal. In reality, the major share of legal services goes to business entities and wealthy people and the prestige and prosperity to the lawyers who serve them. 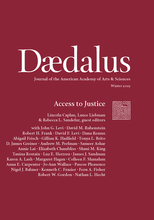 This essay deals with the history of access to justice – chiefly civil justice – and with the role of lawyers and organized legal professions in promoting and restricting that access. In the last century, legal professionals and others have taken small steps to provide access to legal processes and legal advice to people who could not otherwise afford them. By doing so, they have inched closer to the ideals of universal justice. Though the organized bar has repeatedly served its own interests before those of the public, and has restricted access to justice for the poor, it has been a relatively constructive force.